This incredible open floor plan townhouse, in a gated community, is maintenance free with resort style amenities! Located close to 385/85/Woodruff road, you&apos;re minutes away from shopping, restaurants, and activities. 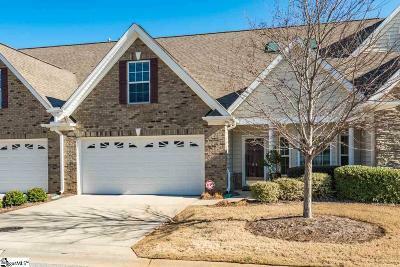 This home has everything you&apos;ve been looking for: the downstairs master bedroom with french doors out to the screened-in porch, a large kitchen overlooking the living room plus a formal dining room for entertaining. Upstairs there&apos;s two guest bedrooms, a hall bath, an office plus a large bonus room. Enough room for hobbies, movie nights, visiting friends and family! Call for a showing today! "My wife and I met Sharon on our first trip to Greenville while searching out neighborhoods to relocate. Sharon helped us by explaining each of the areas in regards to building, real estate costs, schools, etc. The help she provided allowed us to focus our search from abroad. On our second trip to the area, we had only 2 days to see 10+ houses. She coordinated showing all of the houses on our list! We found a gorgeous home in the Carolina Country Club. Sharon helped with Arborist Inspection, General Home Inspection, negotiating a better price on the home, all with our better interests at heart. Her hard work ethic and kind professionalism is outstanding! This is our 3rd home and we could not be happier here. Thank you again Sharon!" We are a Locally Owned and Operated Real Estate Company in the Greenville Upstate Market Representing Home Sellers and Home Buyers in Greenville County. We Have over 20 Years of Experience having represented First-Time Buyers, Relocation Buyers, Empty Nesters, Retirees to the Upstate, Move-Up Buyers, those Selling a Resell Home. We've Represented Engineers, Physians, Accountants, Sales Associates, Professors, Nurses, Teachers, Authors, Business Owners, Home Builders, Medical Office, HR Managers, Fortune 500 Company Associates, and More. Receive the Latest Home Listings when they first come on the market with our Save Search feature. You will be alerted when a new property comes on the market. We can schedule your showing right away so you don't miss out on a Great Home!